Complaints are filed with the Board from many sources and any member of the public may file a complaint. The majority of written complaints received by FBPE are from consumers of engineering services and building department officials. Professional engineers and professionals from related fields, such as contractors, surveyors, and architects, also file many of the complaints that form the basis for investigations. 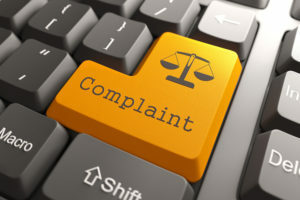 You may file a complaint if you feel that a licensee, firm, or individual has violated the provisions of law outlined in Chapter 455, Florida Statutes, Chapter 471, F.S., and Chapter 61G-15, Florida Administrative Code. 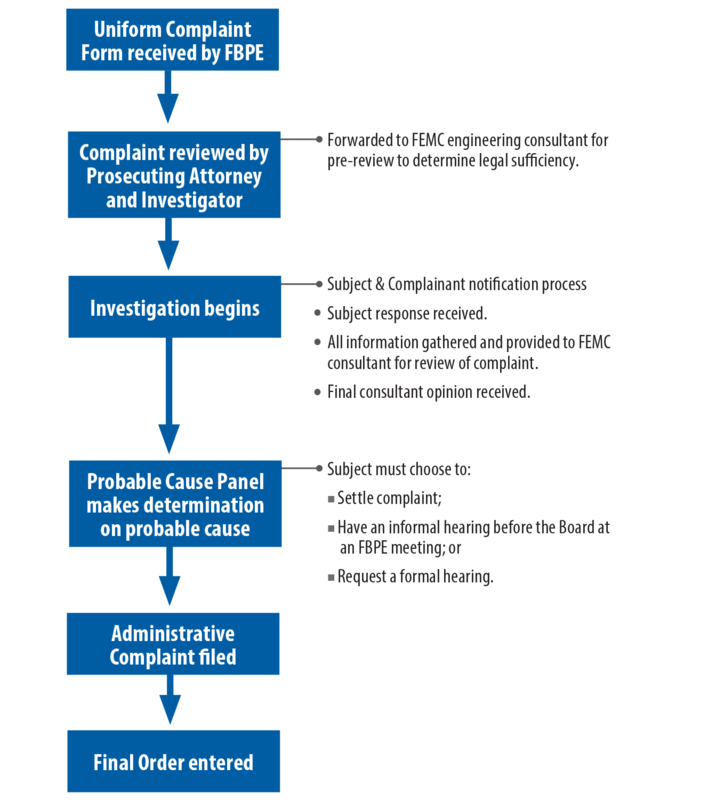 Once you file a complaint, it is forwarded to a FEMC engineering consultant for review. The preliminary opinion and complaint documents are analyzed to determine if what you have alleged is against the law. If your complaint is not a violation of law you will receive a letter indicating the file is being closed. If it is determined that the allegation you have made would constitute a violation of the engineering laws or rules, you will be notified that an investigation will take place. Following the investigation, the case will go to the FBPE Probable Cause Panel, which is similar to a grand jury, and the panel will determine if the case should be recommended to the full FBPE for discipline. The FBPE then serves as jury in the case and decides guilt or innocence, as well as the level of discipline if the accused is found guilty. The Board does accept anonymous complaints. However, the Board encourages the complainant to include his or her name and phone number in case additional information is required. Please understand that if you file anonymous complaints, the investigator will be unable to contact you for clarification or for further information, so it is important that you include all of the information necessary to prove that a violation has occurred. Further understand, you will not be notified of the results of the investigation of an anonymous complaint. If you have a complaint against a licensed engineer or engineering firm, or an unlicensed person or business, please download the form below, fill it out, and send it to the Board office. You will then be contacted by the Board’s investigator. Note: Open the PDF files using Adobe Reader, rather than your web browser, for the interactive forms to work properly.